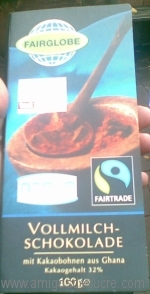 I have been buying Fair Trade products for many years, although I was maybe not aware of the wide range that is now available. I remember trying the coffee for the first time many years ago, and not really being that thrilled with it. That said, there was a time when I regularly bought the orange juice and the quinoa. I returned to the subject a couple of weeks ago during a seminar in Frankfurt, where there was not only a presentation about the Fair Trade principles and organisation, but a chance to try some of the chocolate that is produced, one type of which was actually very good. One question that came up was whether there were coffee pads with the Fair Trade certification – and apparently there are. So I set off in search of them. For a while now my company has been buying a brand of sugar that carries the Fair Trade logo, and now – after visiting several supermarkets in the area – I can happily say that we have switched to the coffee pads as well. Not only do I think that the coffee tastes better than when I first tried it all those years ago, but the pads are actually cheaper than the brand we were using before! Which products do you buy?